With your Christchurch sightseeing pass, you have the flexibility to see the city's top attractions at your own pace and save on ticket fees compared to purchasing each activity separately: the Christchurch Gondola, Avon River punt cruise, the Christchurch Botanic Gardens and the Christchurch Tram. Enjoy the freedom to use the pass at any time during your visit — you choose which days to visit each attraction, with the option to do as much or as little as you like each day. On this 3-hour sightseeing tour, see the sights of central Christchurch aboard New Zealand’s only open-top double-decker bus tour, and then see greater Christchurch on a tour by closed-top double-decker bus. First up, you'll travel around Christchurch in style on board a classic Routemaster double-decker bus, seeing top city attractions like Hagley Park, the Bridge of Remembrance and New Regent Street as you learn about the city's recovery from the 2011 earthquake. Then you'll leave the city center and head to the seaside at Sumner, to the Port Hills for panoramic views and to the beautiful Mona Vale Gardens and up to the Port Hills for more views over the city, as well as the Canterbury Plains to the Alps, and then stop by Mona Vale Gardens to take a stroll around some of the city's loveliest gardens. 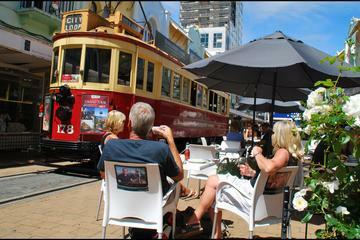 Spend the afternoon discovering Christchurch. This city, famous for its several parks and gardens, will visit the famous Mona Vale homestead and gardens, before climbing the Port Hills for fantastic views of the city, the Canterbury Plains and the mighty Southern Alps. A must see tour for all those vacationing in the 'Garden City'. Experience the 'Garden City' at night! First stop is one of New Zealand's largest Maori Maraes, for a traditional cultural performance. If you love wine then this tour is a must! Explore four of North Canterbury's boutique vineyards, all producing a fine selection of both white and red wines. Visit the Waipara area, well known for its warm dry climate and limestone rich soils, both ideal for quality wine production. Take the opportunity to have a sip and buy a treat from this great wine making region. Akaroa is the only French settlement established in New Zealand. The charm of this old French town with the incredible scenery encountered on the way have assured Akaroa's popularity as a unique destination. Discover this magnificent place on a luxury small group tour including aneco-marine nature and harbour cruise aboard the Canterbury Cat or Dolphins Up Close where you can watch and swim with the Hector's Dolphins just feet away! See three of the best in Christchurch in one day! Visit the International Antarctic Center and experience what life is like on the ice, meet the animals of Willowbank Wildlife Reserve and the Air Force Museum at Wigram, New Zealand's original Air Force base. The Attraction has 28 fully restored aircraft together with newly refurbished static and interactive displays that dramatically enhance the visitors experience. Get close to one of the world's greatest and most graceful creatures - the sperm whale. Head north from Christchurch to Kaikoura, where you can take a whale watch tour by either boat or light aircraft. Have you ever been swimming with dolphins? Don't worry, here's your chance on this full day tour from Christchurch. Journey north to Kaikoura, famous for the variety of marine animals which can be seen. Join your Swim with Dolphins cruise, don a wet suit, mask, snorkel and flippers and then dive into the sea to swim alongside the acrobatic Dusky Dolphins. An awesome encounter that you'll remember for a lifetime! In the heart of the Southern Alps, Arthur's Pass National Park has an incredible diversity of flora and landscape. Today will inspire the photographer and enchant the nature lover! You'll experience a breathtaking journey aboard the TranzAlpine Train winding it's way through the magnificent Waimakariri Gorge. Join short guided walks to rainforests, rivers and mountain vistas and visit the incredible Castle Hill rocks! Journey to the remote and beautiful Mt Potts high country station, home of Mt Sunday; see how this peaceful mountain was transformed into Edoras, the capital city of the Rohan people in the Lord of the Rings trilogy. Immerse yourself in the natural unspoilt beauty of the high country's sparkling clear lakes, glistening blue rivers and fresh mountain air. This great day out includes 4WD access onto Mt Sunday itself, a delicious champagne picnic lunch, fully running commentary from a friendly and knowledgeable kiwi tour guide and spectacular scenery you will never forget. You don't have to be a Lord of the Rings fan to enjoy this amazing day out! Enjoy a horse trek on the scenic Banks Peninsula with magnificent and breathtaking views of the Southern Alps. Ride a variety of terrain, including open flat paddocks, easy rolling hills and steeper, challenging hillsides clad with bush. Suitable for the novice to the experienced rider. You can also choose to combine the horse trek with a jet boat tour on the Waimakariri River or a visit to a working sheep farm. Penguins and kiwis - see them both as you visit two of Christchurch's leading attractions. Experience the atmosphere of Antarctica with a visit to the International Antarctic Centre - you even get to ride a Hagglund all-terrain snow mobile! Come fly with us… there is no other place in the world... where it is possible to fly from the center of the city, in view of the sun rising out of the ocean toward snow-capped mountains. Not only does New Zealand offer some of the most spectacular scenery from above, but it is one of the cheapest places in the world to take advantage of these views. Reserve your space on a balloon over the Canterbury Plains today!